I recently came across this quote and I love it so much. I am always hesitant to use the term “coach,” because it’s so focused on a one way relationship where one person tells the other person what to do. So when people talk about a “coach” in local government, I always think about Pete Carroll. Instead, I think this quote sums up the very best way to be a great mentor or influence in local government, especially to peers whose careers are just starting, or students who are still figuring out which path they want to take. 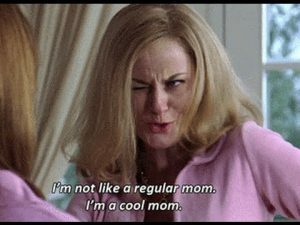 Sometimes I feel like the Amy Poehler character in “Mean Girls” – “I’m not a regular local government employee, I’m a cool local government employee.” That’s not what I’m advocating. 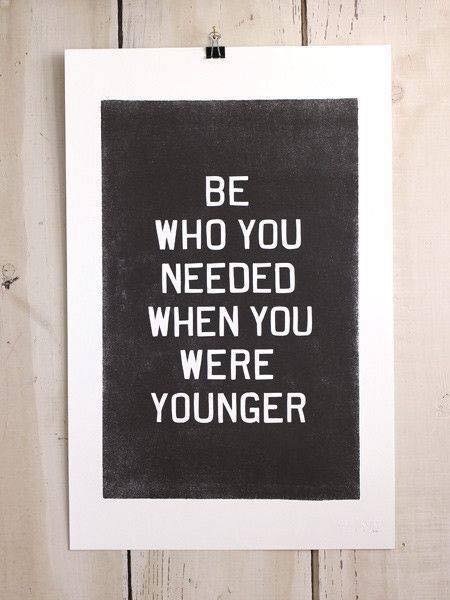 You don’t have to get down with the youths to be a trusted and kind friend to people who are younger than you. 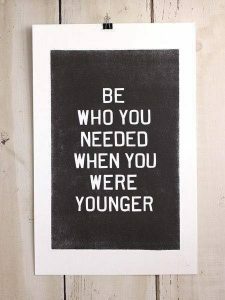 This quote is a good way of reminding yourself that it’s actually quite easy to support younger people in your organization: just reflect on what you needed and be that person. Early in my career, I realized that I was up for a critical promotion and I couldn’t answer the question: Who is going to pound the table to make sure I get this big promotion? So, I asked someone to do that for me. I think a lot about who would pound the table for me, and similarly, who I would pound the table for. Who’s on your list? I’ve used the word “mentor” in this blog and that makes me a little uncomfortable too (not as uncomfortable as “coach” though). Ultimately, yes, in some friendships there’s a dynamic where a person with more experience shares that with someone with less, but I don’t particularly like setting up a dynamic from the start where the learning can only go one way. One of my favorite character traits is curiosity, and cultivating this trait makes it even easier to work well with other people (younger and older than you) because you’re constantly on the look out for things that are interesting, new, creative, and innovative. In the beginning, I felt a little awkward about reaching out to Talya at all. 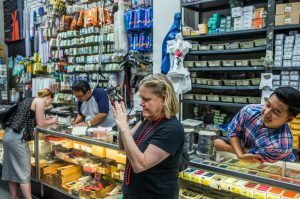 A part of me felt that at my age (mid-50s) it was somehow unseemly for me to ask for help, particularly from one so young. …A possible reason for my awkwardness: Baby boomers tend to have to a hierarchical view of the workplace — an “org chart” mind-set that imagines power filtering down from the top. Millennials, by contrast, may see the office as more of a horizontal network, she said. A few things to note: first, Meredith is very busy. She has a big work portfolio and probably runs from meeting to meeting all day long. 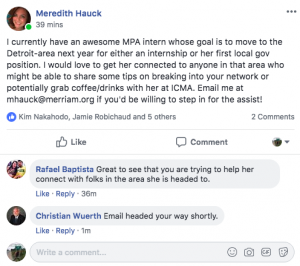 Second, Meredith still took time to post onto the ELGL Facebook Group about an intern’s upcoming move to a new part of the country. We’ve all heard the excuse “I’m too busy” when we ask for help. But what Meredith shows, is that no one is too busy to be helpful. The above post probably took her three minutes total to type out and post (maybe even less if she’s a speedy typist). Merriam is now on everyone’s radar as a place that’s managed by someone who cares deeply about employees and their future success. This took three minutes. No one is too busy to be kind. 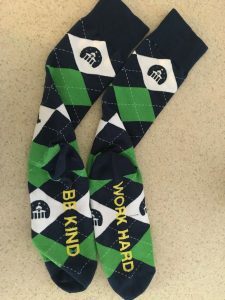 Those are my four mottos to share as we reflect on how to “work hard, be kind” in our local government worlds. What is your motto? Any words of wisdom to share on how to bring kindness to local government and to mentor effectively?